Hello. I'm popping on to tell you about Papercraft Essentials issue 122 which has just hit the shelves. 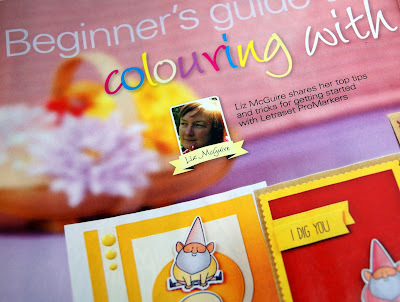 My article is a beginner's guide to colouring using Promarker pens and my cards feature the 'you gnome me' stamps by My Favourite Things - super cute! It's a fabby crafty read and has a brilliant free gift of stamps and a super embossing folder. Brilliant and well done! I shall be off to buy it, and break my 'no more crafting spending in July' resolution :-) Looking forwards to reading it. Fabulous Liz, you clever girl!! !